A beautiful walker in a bright red unique fire engine design, would certainly be the delight of any fire engine enthusiast!! 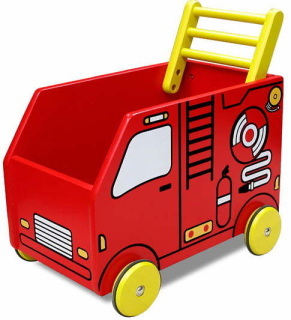 Doubles up as a toy storage box and perfect for wheeling teddy around. This new cheerful baby walker will encourage even the most reluctant crawler to get up and go. The handle of the walker is designed like a fireman's ladder to add some excitement ! !